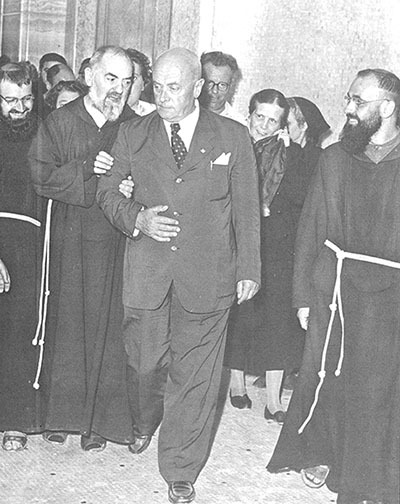 Padre Pio walks arm in arm with Dr. Guglielmo Sanguinetti. Elena Bandini is on the right. On John McCaffery’s many visits to San Giovanni Rotondo, he met a number of people who were very close friends of Padre Pio. One was Dr. Guglielmo Sanguinetti. Dr. Sanguinetti was one of the major collaborators in the building of Padre Pio’s hospital, the Home for the Relief of Suffering. One day when John was at the monastery, he was happy to run into Dr. Sanguinetti as well as one other acquaintance. Dr. Sanguinetti suggested that the three of them go to the small room adjoining the choir loft and discuss some of the upcoming plans for the Home for the Relief of Suffering. At the time, Dr. Sanguinetti was heavily burdened with many difficult decisions that he had to make regarding the hospital. He was trying to raise funds, publish an informational newspaper regarding the hospital, and oversee the construction plans. The plan sounded like a good one, but the men would soon regret it. When Padre Pio rounded the corner and saw the three men discussing business together, he became angry. John and his two companions instantly regretted their decision, but it was too late. “How could you do it?” Padre Pio said. “How could you have a discussion while the Capuchin is preaching a sermon? You must go downstairs at once to the church!” The tension in the air was mounting by the minute. To the men, it seemed like Padre Pio had overreacted. Nevertheless, they followed his advice and went into the church. Later, John and Dr. Sanguinetti would recall the incident and see the humor in it, but at the time it happened, it was no laughing matter. Through the years, John observed that Dr. Sanguinetti always seemed to feel totally at ease whenever he was with Padre Pio. That was rare. Because almost everyone had a certain awe of Padre Pio, it was very difficult for most people to feel completely comfortable in his presence. Not Dr. Sanguinetti. He was able to be truly natural, truly “himself.” Knowing that, Padre Pio could let his guard down and could relax in his company. It was something that he was not able to do with many people. Once, John and Dr. Sanguinetti were saying goodbye to Padre Pio after visiting him. Padre Pio suddenly became serious. For some time, he stared intently at John and at Dr. Sanguinetti and finally said to them, “Who knows when and where we will meet again.” John wondered what Padre Pio meant by the mysterious comment. Shortly after that and quite unexpectedly, Dr. Sanguinetti died of a heart attack. His death came as a terrible blow to Padre Pio and it left a great void in his heart. It seemed that no one was able to console Padre Pio over the loss of his dear friend. Several months later, John returned to San Giovanni Rotondo for a visit. When Padre Pio saw John, he began to cry. They went into a private room in the monastery so that they could talk together. “You probably did not think that you would ever see me in a state such as this,” Padre Pio said to John. The tears flowed freely from his eyes. “We lost our good friend,” Padre Pio added. “Unlike you or me, God saw that Dr. Sanguinetti was ready to be with Him in eternal life.” John tried to comfort Padre Pio in his sorrow but no words could console him. 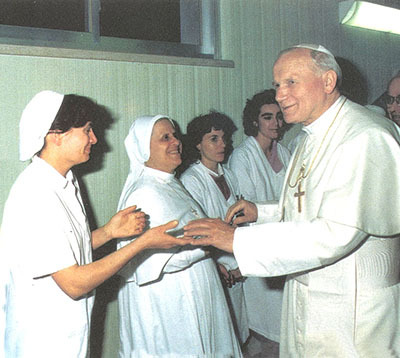 Pope John Paul II greets staff on a visit to Padre Pio’s hospital, the Home for the Relief of Suffering in 1987. In addition to Dr. Sanguinetti, another one of Padre Pio’s spiritual children that John felt fortunate to meet was a woman named Elena Bandini. Elena, a Third Order Franciscan, had dedicated herself totally to her faith and to many charitable and apostolic works. She began writing to Padre Pio and seeking his spiritual direction in 1921. In 1937, she moved from her home in Mugello to live permanently in San Giovanni Rotondo. She served Padre Pio’s apostolate in innumerable ways. When Elena was diagnosed with stomach cancer, her strength of character and her heroic spirit became apparent to all. The suffering that Elena endured was almost unbearable. However, she did not pray for a healing. She offered all of her sufferings to God and united them to Padre Pio’s sufferings, for his intentions. John visited Elena right before she died. His heart was moved with pity to see her in so much pain. Her resignation to her illness was beautiful and her profound spirituality was evident, even on her death bed. During one of his visits to the monastery of Our Lady of Grace, John met a man named Giovanni and soon they became fast friends. Giovanni was known simply as Giovanni da Prato, since he was originally from Prato, Italy. He had a deep conversion experience through his contact with Padre Pio and was able to completely reform his life. Giovanni da Prato drove a taxi for a living and in times past, he had a serious drinking problem. When he drank too much, he would often become violent. Once, after an evening of excessive drinking, he struck his wife and then collapsed in a drunken stupor across the bed. Suddenly, he felt the bed moving. He looked up to see a Capuchin, holding onto the bed rail and shaking the bed. The Capuchin, who had a very angry look on his face, was staring directly at Giovanni. “You have gone too far this time!” the dark-robed figure said to Giovanni. With that, the Capuchin disappeared. Giovanni told his wife about the mysterious Capuchin who had stood beside his bed. “I have been praying to a priest named Padre Pio,” his wife said. “I have been invoking his presence so that he will protect me against your drunken rages.” Later, she admitted that she had sewn a picture of Padre Pio inside Giovanni’s pillow case. His wife’s words aroused his curiosity. He got in his taxi and made the long journey from Tuscany to San Giovanni Rotondo. He had to find out if Padre Pio was the same man that he had seen in his bedroom. When Giovanni arrived at the little church of Our Lady of Grace, he noticed many people standing both inside and outside the church with rosaries in their hands. The sight of it was disgusting to him. He assumed that they were all religious fanatics. Giovanni had very little respect for people who claimed to have faith. He had always considered religion to be a matter of superstition. As an active member of the Communist party, Giovanni had spent years persecuting people who professed religious faith. Giovanni was standing in the sacristy of the church when he saw Padre Pio for the first time. He immediately recognized him as the man who had stood beside his bed. “So, the mangy old sheep has arrived!” Padre Pio said when he saw Giovanni. It was definitely not a warm welcome. Giovanni wanted to speak to Padre Pio privately. Ever since he had the strange experience of seeing Padre Pio in his home, he had begun to think about the meaning of life. If faith was important and if God really existed, Giovanni wanted to discuss the matter with Padre Pio. He was told that the only way to do so was to go to confession to him. He decided to take the plunge. In the confessional, Giovanni was shocked to hear Padre Pio say to him, “You must leave at once. I cannot hear your confession. You must find another priest. I do not want to go to hell for you!” After hearing the harsh words, Giovanni had no peace of mind. He was angry at Padre Pio for speaking to him in such a cutting manner, but after a short time, his anger subsided. He desperately needed some answers to his questions and he felt that Padre Pio was the one person who could supply them. One morning, after Giovanni attended Padre Pio’s Mass, Padre Pio spoke to him briefly. He tapped Giovanni on the head and said to him, “It is not true what you were thinking in the church today, ignoramus! I want you to learn how to pray the Rosary!” Obediently, Giovanni went and bought a little devotional book with instructions on how to pray the Rosary. Not long after, Padre Pio heard Giovanni’s confession. For the sins that Giovanni had forgotten, Padre Pio named them for him. During his confession, Giovanni broke down and cried. Padre Pio cried as well. Giovanni handed his Communist party membership card to Padre Pio and asked him to throw it away. Padre Pio said, “Yes, that is good. I will indeed destroy it.” Giovanni invited many of his former Communist friends to visit the monastery. He introduced them to Padre Pio and many were converted. Padre Pio explained to Giovanni that he had hurt a lot of people and needed to make amends for his past sins. He told Giovanni that he must go to the last Mass each Sunday until further notice. At that time, the fasting rules of the church were such that one had to fast from midnight until the time one received Holy Communion the following day. That meant that every Sunday, Giovanni would have to fast from the previous night until the end of the next day. Everyone without exception went to Sunday Mass in the morning, in part because of the strict fasting rules. People were generally quite hungry after fasting from midnight the night before. They usually went directly home after Mass in order to have breakfast. No one received Holy Communion at midday or at the end of the day. For Giovanni, not only was the penance difficult, it was also humiliating. As he walked down the aisle to the communion rail all by himself and knelt there alone, he felt embarrassed. He had to endure the rude remarks of the people in the church who whispered together about him and stared at him curiously. Giovanni visited the monastery as often as he could. Sometimes he would reflect on his life and say to himself, “Why am I so captivated by this elderly priest? Why have I left everything for him?” Giovanni knew in his heart that he would never return to his former way of living. On several occasions, while sitting in the little church of Our Lady of Grace, he had seen Padre Pio’s face shining with an unearthly beauty. He asked one of the pilgrims if he had ever seen the radiance on Padre Pio’s face. “Indeed I have seen the same thing,” the man replied. Giovanni spoke to Padre Pio about it. “Father, your face is so very beautiful.” “Why would you say something like that to me?” was Padre Pio’s only reply. One day at the monastery, Giovanni was present when Padre Pio and some of his fellow Capuchins were talking together. The subject of Padre Pio’s stigmata came up. “Tell us how you received the stigmata,” one of the Capuchins said to Padre Pio, but he made no reply. Several of the Capuchins gave their opinion on the matter and each one had a different idea. “It was the crucifix in the choir loft of the church that imprinted the wounds of Christ on Padre Pio’s body,” one of the Capuchins stated. “And what do you think happened, Giovanni?” Padre Pio asked. “I have a different thought about it than the others,” Giovanni replied. “I think that Jesus came down from heaven and embraced you. At his embrace, you received the stigmata.” “You are closer than all of the others in your explanation,” Padre Pio replied. But he would make no other comment. John McCaffery had an adventure with Giovanni da Prato on one occasion that he would never forget. One day, he happened to see Giovanni at the monastery. Giovanni told John that he had a great desire to see Padre Pio that day. “Oh, but it is impossible,” John replied. “Padre Pio is sick and confined to his cell. No one is allowed to visit him today.” “I will tell you a secret if you promise not to tell anyone,” Giovanni said. “I happen to have a key that leads to the monks’ cells.” “How on earth did you manage to get a key?” John asked. But Giovanni would not answer the question. “Don’t worry about how I got the key. Let’s just try our luck!” Giovanni said. Giovanni’s bold and daring spirit gave John the courage he needed to do something that was very much against the rules. The two men walked past the “no visitors allowed” sign in the monastery and unlocked the door that led to the cloister. They walked down the hall very quietly so as not to arouse attention and then opened the door to Padre Pio’s cell. Once inside, they saw that Padre Pio was all alone. They spent just a few moments with him. Padre Pio received them kindly and gave them each a blessing. Giovanni had received his heart’s desire. On one occasion, John told Padre Pio about a brand-new book that had just been published in Ireland. “What is the book about?” Padre Pio asked. “It is a book about you,” John replied. At John’s words, Padre Pio became distraught. With tears in his eyes he said, “You are the ones who are good. Not me. I know that God has given me many graces. But it frightens me to think about it because I do not think that I have made good use of the gifts that I have been given. I think that anyone else would have made better use of them than I have.” John tried to convince him otherwise but he was not able to change Padre Pio’s mind. During John’s visits to the monastery of Our Lady of Grace, he came in contact with a number of people who had received miracles through the hands of Padre Pio. John witnessed some of the miraculous cures with his own eyes, including the complete healing of a man who had throat cancer. The pain of the man’s illness was intense and he was only able to speak in a hoarse whisper. As his disease progressed, his speech became completely inaudible. It even became difficult for him to breathe. The man and his wife had moved from Milan to San Giovanni Rotondo in order to be close to Padre Pio. Every day, he stood in the sacristy, waiting for Padre Pio as he passed through the sacristy to the church. When Padre Pio came into view, the man would simply look at him and in silence, he would pray to him for healing. But the man’s faith was put to the test. He had been suffering from the disease for over a year, and his condition was growing steadily worse. Padre Pio later advised the man to have surgery in the city of Bologna and gave him the name of a highly-skilled doctor who could help him. The man followed Padre Pio’s advice and had the operation. The next time he returned to the monastery, his voice was strong and he had regained all of his former vitality. He said that the doctor had given him a clean bill of health. John was amazed to see the complete transformation in the man. As John witnessed the healings around him, he reflected on his own poor health. He had a heart condition which caused him to experience heart palpitations and made him so uncomfortable that at night he had to sleep sitting up in a chair. He was frequently tormented by severe and recurring headaches. One night he lost consciousness and was rushed to the hospital. He had suffered a partial stroke. He often feared that he would die an untimely death and he worried about his wife and children. Who would provide for them if he should pass away? One day at Padre Pio’s Mass, John prayed silently and with great intensity, begging Padre Pio to intercede and to heal him of his heart condition. That afternoon, John saw Padre Pio in the monastery. He spoke to John very tenderly and said, “I want you to know that my prayer for you is that you go to heaven. I want you to be satisfied with that. I ask you to pray for me as well, that I might go to heaven. Do you understand what I am saying?” “Yes, I understand,” John replied. He was disappointed at Padre Pio’s words but he tried his best not to show it. Padre Pio had obviously been aware of John’s prayers at the Mass that morning. His comment indicated to John that he was praying for his salvation, not necessarily for his health. Evidently, John was not going to receive a healing for his failing heart. After speaking to John, Padre Pio continued to converse with the others who were present. John was preoccupied with thinking about the remark that Padre Pio had made to him. He was trying to hide his feelings of sadness. Several times that afternoon, John noticed that Padre Pio was staring at him with a very penetrating gaze. When it was time to say goodbye to Padre Pio, all the men who were gathered knelt down to receive his blessing. Once again, Padre Pio scrutinized John with great intensity. He blessed all of the men and then embraced John in such a way that John’s head rested on Padre Pio’s chest, near the wound in his heart. Padre Pio held John’s head against his heart wound for some time. It was the third time that day that Padre Pio had embraced John in such a way. After Padre Pio departed, the others who were present told John how lucky he was. He had obviously been singled out for a special blessing that day. Some time later, Padre Pio placed the palm of his right hand against John’s heart. After that, John never again had any signs or symptoms of a heart condition. The next time he went in for a checkup, the doctor informed him that his heart was in perfectly good condition. After Padre Pio’s death on September 23, 1968, John McCaffery never went back to San Giovanni Rotondo. He had visited Padre Pio countless times over a period of many years. With Padre Pio gone, John could not bring himself to return. He knew that it would not be the same. John had made many good friends in San Giovanni Rotondo. He was not to see any of them again. He went back to his home in Donegal, Ireland where he stayed for the rest of his life. John passed away in 1981.